Zion Market Research has published a new report titled “Coated Fabrics Market by Product (Polymer, Rubber, and Fabric-Backed Wall Coverings) and by Application (Transportation, Protective Clothing, Industrial, Awnings, Roofing & Canopies, and Furniture & Seating): Global Industry Perspective, Comprehensive Analysis, and Forecast, 2017– 2024”. 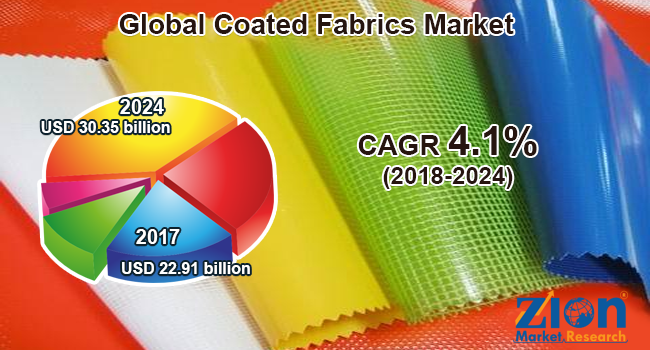 According to the report, the global coated fabrics market was valued at USD 22.91 billion in 2017 and is expected to reach USD 30.35 billion by the end of 2024, growing at a CAGR of 4.1% between 2018 and 2024. Coated fabrics are known and widely used for their versatile properties like excellent stability and durability, among others. These properties have led these fabrics’extensive use across varied end-use industries, such as construction, oil and gas, and transportation. The recent technological advancements made related to coated fabrics have increased the number of product applications across multiple industries. The global coated fabrics market is expected to witness a significant growth rate in the next few years, which, to some extent, can be attributed to the rising demand for protective clothing in military,oil, and gas, and automotive industries. In addition to this, it is also the growing demand for coated fabrics in the transportation sector that is likely to have a prominent influence on the global coated fabrics market. Moreover, material properties like dirt and oil-repellent, water-resistant, rot-proof, and UV-resistant has led to the extensive use of coated fabrics for the manufacturing of automobile components. Coated fabrics are also used to manufacture vehicle airbags and seating, upholstered furniture, protective apparel, belts, and shoes, which will certainly have a positive impact on this market’s overall growth. However,the fluctuating raw material prices of coated fabrics are projected to restrain the expansion of the coated fabrics market. The increasing technological advancements made in the manufacturing of coated fabrics is also expected to offer new market growth opportunities. The coated fabrics market is divided based on product and application. By product, the market is fragmented into rubber, fabric-backed wall coverings, and polymer. The polymer coated fabrics are widely used in varied industries, due to their resistance to fire, water, and abrasion, among other properties. In addition to this, the rubber coated fabric segment is electrically conductive and resistant to temperature, oil, and weather, which makes it useful in construction and transportation, among other industries. This is further expected to fuel the market growth of coated fabrics. By application, the market is categorized into protective clothing, transportation, awnings, industrial, roofing and canopies, and furniture and seating. The protective clothing segment is anticipated to dominate the market and witness a significant growth rate in the near future. Coated fabrics are widely being used for manufacturing protective clothing, which is also a key growth driver. Geographically, Asia Pacific accounted for the highest share in the global coated fabrics market in 2017. AsiaPacific and North America is projected to be the fastest growing regional markets for coated fabric and continue its dominance in the upcoming years as well. The growing automotive industry in emerging countries,such as China and India, is projected to escalate the use of coated fabrics during the forecast timeframe. Growing automobile industry in Latin America is anticipated to boost the coated fabrics market growth. The European coated fabrics market is likely to grow substantially as well,owing to the increasing demand for coated fabrics in the transportation sector. Furthermore, the dominance of the oil and gas industry in the Middle East and Africa is also projected to help in the expansion of the coated fabrics market significantly. The global coated fabrics market involves a large number of end-players, such as Omnova Solutions, Saint-Gobain, Takata Corporation, Canadian General Tower, Bo-Tex Sales Co., ContiTech AG, Mauritzon Inc., Graniteville Specialty Fabrics, and IsotexS.p.A., among others.